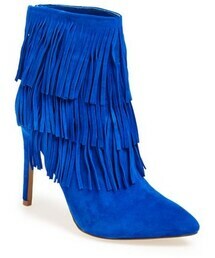 Tiers of lush fringe lend swingy bohemian flair to a swank suede bootie perched on a slim stiletto heel. 4 1/4" heel (size 8.5). 5" boot shaft. Back zip closure. Suede and textile upper/synthetic and textile lining/synthetic sole. By Steve Madden; imported. BP. Shoes.